Regal Vineyard’s Haunted Winery, located just 7.8 miles from Grand River Cellars Winery and Restaurant, is truly haunted. This haunted house stands in Ashtabula County’s oldest winery – established by the Cohodus family who immigrated from Lithuania in 1919. 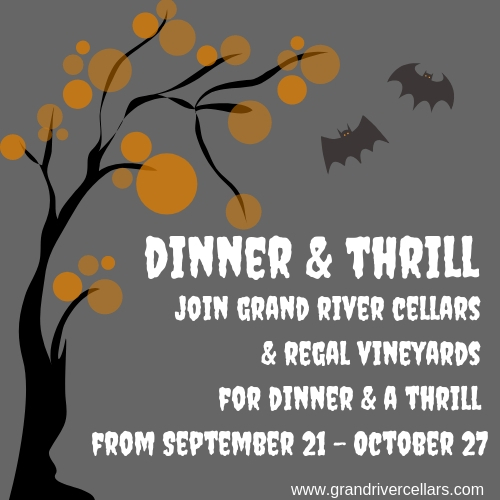 Join Grand River Cellars and Regal Vineyards for the annual Dinner and a Thrill Package! Stop at Grand River Cellars for dinner before visiting the Haunted Winery for an evening of chills and thrills. Your $24 package gives you $15 towards any appetizer/dinner AND admits you into the Haunted Winery (a $30 value). While at Grand River Cellars, be sure to sample the Fright White or the Blood Red – the official wines of the Haunted Winery – and read all about the history of the Cohodus Family. Looking for a different adventure? For just a $4 up-charge you can skip the Haunted Winery and enjoy a thrilling and chilling game of Zombie Tag and finish with the Haunted Corn Maze if you dare! Both Zombie Tag and the Corn Maze are located on the same property as the Haunted Winery. REMINDER: YOU MUST MAKE RESERVATIONS AT GRAND RIVER CELLARS FOR DINNER. PLEASE CALL 440-298-9838 TO RESERVE. PURCHASING YOUR TICKET ONLINE DOES NOT INCLUDE YOUR RESERVATION FOR DINNER.